On Sunday, Dec. 16, from 3 p.m. to 7 p.m. the foundation will sponsor a celebration. 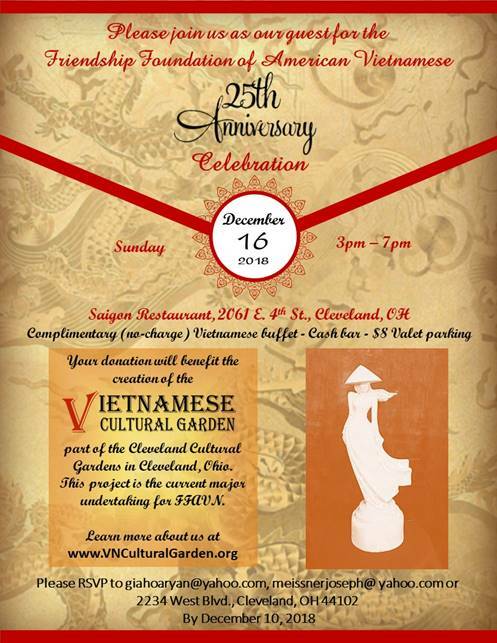 This event will take place at the Saigon restaurant on east 4th–Cleveland’s downtown restaurant avenue. All sorts of Vietnamese foods will be available. Director Ryan is the hostess for this event. She and her staff welcome everyone. More information is available here. Veterans groups and the public are invited to attend the commemoration of the attack on Pearl Harbor to be held at 11:30 a.m. aboard the USS Cod Submarine Memorial on Dec. 7, 2018. Visitors should arrive by 11:15 for the event. A coffee reception will be held at Burke Lakefront Airport Concourse (Gate 5) for the public after the wreath ceremony. USS Cod is docked on 1202 North Marginal Rd., between East 9th St and Burke Lakefront Airport. For more information contact: Paul Farace, President, USS Cod Submarine Memorial Where Cleveland Honors Veterans! at 216-408-6991 or www.usscod.org. https://clecityhall.files.wordpress.com/2018/07/2018-usono-golf-outing-full-page.pdf or call (614) 644-0898.